Representation of an out-of-body experience (OOBE) in which the astral body hovers over the physical body yet remains connected. From Projection of the Astral Body by Sylvan Muldoon and Hereward Carrington (1929). Courtesy Fortean Picture Library. The physical body has an invisible double known variously as the spirit, ethereal body, or astral body. Astral projection (or OOBE—Out-Of-Body Experience) is the ability to send out this etheric double, causing it to travel elsewhere without the physical body. The ability is inherent in most individuals and frequently occurs spontaneously. However, the majority of recorded cases of astral projections have occurred after development of the skill by long and assiduous cultivation. In astral projection, your physical body relaxes and rests while your etheric double departs from it, maintaining an apparently tenuous yet surprisingly strong connection in the form of an infinitely elastic silver cord. This silver cord is what draws you back to your physical body in case of any emergency. Some say that the astral body emerges from the physical body through the solar plexus. Others say it is from the position of the Third Eye or from the crown chakra. The person projecting often experiences what feels like a rapid shaking or vibration of the physical body at the moment of departure. From whatever point it leaves, the astral body floats up and away from the physical body so that it is possible for one versed in the art to look back down at their own sleeping form. Then the etheric double moves away rapidly to wherever it wishes to go. It travels with the speed of thought. If you decide you’d like to be half way around the world, you will be there immediately; and can return just as fast. Many dreams may be the remembrance of astral journeys undertaken while asleep. All people dream, though not everyone remembers his or her dreams. Frequently dreams seem ridiculously involved and mixed up. This is because only the highlights of several dreams are remembered. The average person experiences a large number of dreams during the course of a normal night’s sleep. Suppose that in the dream state—more correctly, on the astral plane—you take a trip to Scotland and do some salmon fishing. From there you travel to the Orient and have a pleasant journey in a sampan. Then you may visit the pyramids in Egypt before rounding out the night reenacting a battle of the Civil War. On waking, you may have only a confused recollection of what seemed like one long, very strange dream. In it, you were drifting down the Nile River in a Chinese junk that suddenly disappeared and left you fighting Confederate soldiers with nothing more than a salmon-fishing pole! The steps to remembering astral journeys, and later actually directing them, start with simply remembering the dreams. These should be written down in as much detail as possible immediately upon waking. You may remember very little to start with, but should persevere. Slowly more and more dreams will be remembered until each can be separated and all of the details noted. The next step is to decide, before going to sleep, what dream you would like to have. More exactly, where you would like your etheric double to travel on the astral plane. Tell yourself exactly where you want to go, and what or whom you want to see. The following morning again record the details of your dreams, and see if there is any connection between them and what you wanted to do. After a very short period of training you will find that you can, in fact, go where you want to go. A number of astral projection cases involving surgery patients have been reported. After submitting to the anesthesia, the patient has astrally projected to watch the operation take place. Floating at ceiling level, the person has seen their own body being operated on and has given the full details to the surgeon on recovering. There are hundreds of cases on record of people who have astrally traveled to a house they have never been to before, and later have given accurate details of the rooms, decorations, people and actions taking place. Sylvan Muldoon was an accomplished projector. In 1924 he went to sleep and felt his etheric double take off, passing through the walls of his house. He was brought into a house he had never seen before and in it discovered an attractive young woman who was sewing a black dress. He stood for a while and studied her, before returning to his physical body. Six weeks later he happened to see the same girl get out of an automobile. He approached her and asked where she lived. She told him it was none of his business, but he explained to her why he asked. He went on to describe the room where he had seen her sitting, and other members of her family. She confirmed all he said, and that was the start of a long friendship and even astral projection projects, which they did together. If we look to scientific sources for information about OOBEs we shall find practically none at all. Scientists have, by and large, simply not paid any attention to these phenomena. The situation is rather similar to that of the scientific literature on extrasensory perception (ESP). Phenomena such as telepathy, clairvoyance, precognition, and psychokinesis are ‘impossible’ in terms of the current physical world view. Since they can’t happen, most scientists do not bother to read the evidence indicating that they do happen; hence, not having read the evidence, their belief in the impossibility of such phenomena is reinforced. This kind of circular reasoning in support of one’s comfortable belief system is not unique to scientists by any means, but it has resulted in very little scientific research on ESP or OOBEs. One way some people first experience and experiment with astral projection is through what is known as the “false awakening.” Most people have had the experience of half-waking in the morning and knowing, or being told, that it is time to get up and get dressed. They get out of bed and sleepily start to dress. They may ponder what to wear, reach a decision, and then fully dress. They may even go into the kitchen to make a cup of coffee. Suddenly the alarm clock goes off again, or someone calls, and they realize they are still in bed! Yet they could have sworn they had actually got up and got dressed. This is a case of the astral body acting out the getting up and getting dressed. If you can realize, at the time, that this is only your astral body operating, and that your physical body is still asleep, then you can go on from there and direct yourself where you will. Some people believe that they are able to leave their bodies, spiritually, through the practice of astral projection. Astral projection refers to the supposed ability to travel—to project oneself—out of the body. Astral projection is the older term for what has come to be known as out-of-body experiences. This “projection” is conceptualized in terms of the soul or individual human consciousness traveling outside the physical body in a spiritual or astral body. The astral body is said to be an exact replica of the physical body but composed of subtler elements, etheric in nature, more akin to the life force than to matter. It is supposedly capable of detaching from the physical body at will, or under certain special circumstances. It can also spontaneously leave the physical body during sleep, trance or coma, under the influence of anesthetics or other drugs, or as the result of accidents. The astral body is the vehicle of consciousness, said to particularly embody desires and feelings. When it separates from the denser physical body, it takes with it the capacity for feeling. As one might well anticipate, the existence of such a body has not been proven to the satisfaction of mainstream science. 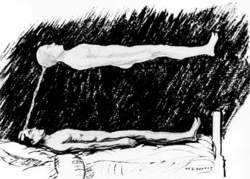 The concept of bilocation, the ability to be in two places at the same time, is associated with the notion of astral projection. Because a person cannot literally be in more than one place at the same time, one possible explanation is that the physical body is in one place while the astral body is in another. Many everyday experiences of astral projection have been reported. Among the researchers who have studied this phenomenon is the British scientist Robert Crookall, who compared hundreds of cases in which people left the physical body and reentered it after traveling unseen in the astral body. Sylvan Muldoon and Hereward Carrington, in their famous books The Phenomena of Astral Projection and The Projection of the Astral Body, maintain that there are degrees of projection, ranging from fully conscious projection to unconscious projection, such as occurs during sleep. Unconscious projection during sleep is often associated with certain types of dreams, such as “psychic” dreams in which one dreams about something happening many miles away and then later discovers that whatever one dreamed about (for instance, a conversation, a disaster) actually occurred. One possible explanation for such dreams is that during sleep the dreamer unconsciously projected his or her astral body, was spiritually present when the event occurred, and remembered the experience later as a dream. Astral projection has also been used to explain the prevalence of dreams about flying. Flying is one of a handful of dream motifs that are so common that almost everybody has had them on more than one occasion. These motifs include such common scenarios as falling dreams, dreams of nakedness in public, and unpreparedness dreams. Such shared dreams tend to arise from experiences and anxieties fundamental to all people. Although flying is one of these shared motifs, it is difficult to clearly identify the common human experience that might account for the prevalence of flying dreams. (Note that flying was a widespread motif even before the advent of airplanes, being extensively treated in Artemidorus‘s ancient classic, the Oneirocritica.) One explanation sometimes put forward by occult and metaphysical writers is that during sleep everyone at times travels outside the physical body, unencumbered by such physical limitations as gravity. Such out-of-body experiences are then remembered as dreams in which the dreamer floats and flies. Though the Goa scene has waned a bit in the past couple of years, Astral Projection carry on regardless. EsoDates members write articles on spiritual subjects (such as astral projection, meditation, reiki, witchcraft, etc. Dreams of falling, flying or floating in space are all symptoms of astral projection. I'm going to be doing astral projection,'' says magician David Blaine, as he discusses his latest magical trick -if that's what you can call it. We used to go to car boot sales and pick up old psychedelic records and play in bands that we'd christen The Astral Projection Society. After settling in (for now) in Florida, Easter begins to experience the most unexpected form of motion: she has moments of astral projection. They reckon it is a handicapped soldier capable of astral projection - the ability leave his body. Time and again, I have been asked by well-meaning people why I believe individuals who claim to have special psychic and supernatural powers-like psychokinesis, telepathy, remote viewing, astral projection and precognition-when there is no scientific proof.